Now these homemade mini apple pies are not tiny they are just a smaller size, about the same size as a meat pie. This recipe is not totally lactose free. The shortcrust pastry does have butter in it but the rest of the recipe is lactose free. It's hard to avoid milk and butter sometimes and there are days when you just want a nice homemade apple pie in cold weather to make you smile and warm you up. 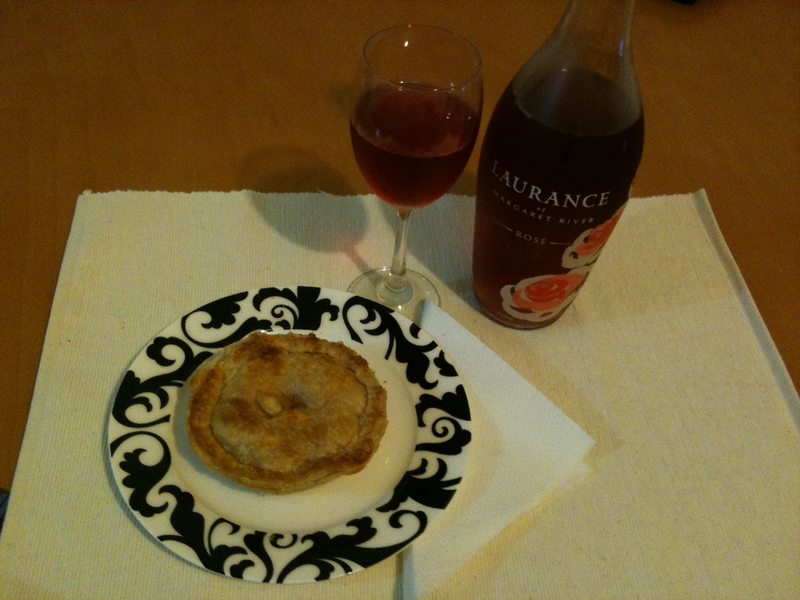 As you can see I had my yummy little pie with a delicious glass of Laurance Rose. Preheat oven to 200°C. Combine apple, caster sugar and water in a saucepan over medium heat. Cook, stirring for 2 minutes or until sugar dissolves. Cover and simmer, turning occasionally, for 2-3 minutes or until apple is just tender. Set aside for 30 minutes to cool completely. Meanwhile, line the bases and sides of two round 9cm (base measurement) pie tins with half the pastry and trim excess. Place in the fridge for 15 minutes to rest. Using a pastry brush, brush the edges with melted margarine. Use a slotted spoon to divide the apple mixture evenly among the pastry cases. Then sprinkle in 1/4 teaspoon cinnamon sugar and drizzle 1/2 teaspoon honey. Once cooked you will taste the delicious honey coming through, it really adds to the flavour. Use the top of a pie tin which is 12.5cm round and cut 2 discs from the remaining pastry. Top each pie with a pastry disc and use a fork to press the edges to seal. Use a small sharp knife to trim any excess pastry and cut a small slit in the centre of each pie. Make little pastry leaves as decoration on top. Simply cut small leaf shapes and then with the tip of the knife cut in a few leaf details. Brush the tops with the melted margarine and sprinkle cinnamon sugar. Place pies on a baking tray. Bake in oven for 25-30 minutes or until golden. This recipe is meant to make two pies but I found I could make three.